All stones shown. White to kill. Also titled as '铁網势' in Wang Runan's book. This problem assumes that there are no other stones on this board, and therefore simply saying that the result is "ko" is insufficient. Solvers are required to evaluate the outcome of the ko-fight. Lim Yoo Jong calls this problem "the emperor of life and death problems". This problem is a contender for the title of the most difficult problem ever. XuanxuanQijingProblem35 Problem 35 in the same collection is a much simpler version. 小鐵網勢 Little Wire Net. This problem should be numbered as 213, and the Variation 2 35. How about separating them? IronChefSakai I've gone ahead and split the two problems into separate pages. I was very confused when looking at the Xuanxuan Qijing PDF and seeing that problem 35 was not in fact the big wire net. In the initial posting, the stone exists. As a result, the solution includes it. tchan001: I have looked at 4 chinese versions of the book and both do not have the stone. Xuanxuan Qíjing ISBN 7-80130-868-9 seems to be based on the Hashimoto Utaro version while Xuanxuan Qijing New Explanations ISBN 7-5009-0055-4 has a similar diagram vertically oriented but the solution is different from the Hashimoto Utaro version of the answer. The second book simplifies things by just showing lines where Black avoids the capture of the four stones in the corner. There is a very good explanation on the various editions of XXQJ in the taiwanese version ISBN 957-561-196-9 from Mercury Publishing. I will talk about it on the main thread about the book XuanxuanQijing. Basically, the Japanese versions are organized differently from the original Chinese edition. This edition does not have the stone. Lastly, I have checked the Xuanxuan Qijing ISBN 7-80511-757-8 from the Chinese Weiqi Ancient Manuals Big Series. This does not have the stone either. This version does deal with the ko. This book has Chen Zude as the chief editor so not sure if the ko version was in the original chinese version or placed there by Chen Zude's team. Now, the problem can be corrected safely. I ordered three Chinese books of Xuanxuan Qijing last week and the two books you commented are included. Before arriving of the book, I got some contents about the second book from Chinese go community. I also found a digital contents of another book. The two books are different from Japanese or Korean version, so I think those are based on original Chinese source. Xuanxuan Qijing New Explanations(玄玄棋经新解) is edited by Wang Runan 8 dan in 1988. The book is unique and valuable since it's not based on the other sources - especially Japanese and Korean. 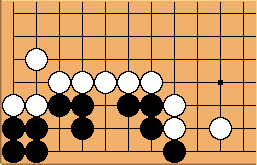 However, the variation of this problem is wrong because Black can resist by ko. This is very interesting since it possibly means that the original solution(or author's intention) of Xuanxuan Qijing Problem 213 was not the ko variation.